At one point in time, you could only find very basic travel guide books and most of them covered a wide area. These days, there are more guidebooks available than ever before and they have become increasingly specialized, focusing on cities, neighborhoods, interests and even food. This is great for travelers streamline a trip and see what they want to see. 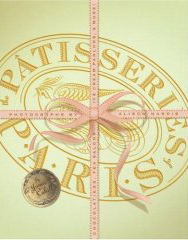 The Patisseries of Paris: Chocolatiers, Tea Salons, Ice Cream Parlors, and more is essentially this type of guidebook. In a city that is known for having some of the most impressive sweets and pastries in the world, this book is intended to help you navigate through the city and pick out the very best ones. The book is divided up by neighborhoods, or Arrondisements. You’ll probably notice that some have quite a few more listings than others, and these neighborhoods tend to be the older ones towards the center of the city. Fortunately, this is also the area where a lot of attractions are, like the Louvre and Notre Dame, so if you’re traveling and staying elsewhere in the city, you’ll almost definitely be right nearby most of the listings in the book at some point or another. The listings are little reviews of what makes the shops grea, listing their specialties and some historical information about the patisseries – which is particularly nice for the older shops. There is also practical information, like the address and operating days/hours of the shops. With guide books, it’s really hard to find out how reliable they are if you haven’t been to a city yourself to compare. The Girl Who Ate Everything actually did a three part comparison on her blog of the shops, as she visited them, to the lsitings in the book! The book actually did quite an accurate job, from the sound of it, but it’s great to see TGWAE’s personal photos of all the sweets mentioned in the guide. Check out Paris Patisseries Part 1, Part 2 and Part 3 for the comparisons. I’ll be arriving in Paris Thursday — yay!! This is a great idea, and a great way to combine travel with food. This is great because my wife loves to travel, while I love to EAT! Next month I will go to Paris on Vacations and visit Europe for the first time. It´s my first adventure!!! I will update my blog soon!